The Crooked River Boat Ramp at Lake Billy Chinook is a good place to go get wet in Central Oregon. You can either do this as a shore dive or a boat dive depending on if you bring a pontoon or motorboat with you. The site varies from a fairly shallow and sandy bottom to deep, steep, and rocky. There is a fair amount of boat traffic in the summer around the boat ramp but there are plenty of other places to enter and exit the water nearby for shore diving. We have had a good time searching for objects lost by boaters at the boat ramp. More often than not, it seems that there is a boater with something that just fell overboard who is very happy to see a couple SCUBA divers in the parking lot. Copyright 2009 Sarah McDevitt. 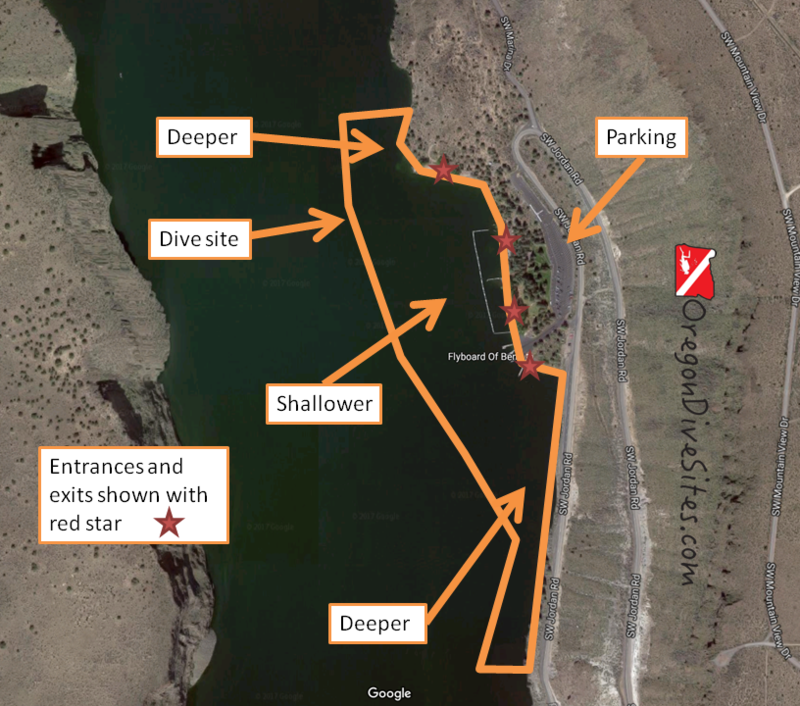 Lake Billy Chinook has a lot of potential for SCUBA diving if you have a boat. The Crooked River Boat Ramp is a good place to put your boat in or to shore dive. The draw for us to dive around the Crooked River Boat Ramp is the underwater topography. While the swimming area and directly around it are relatively shallow and sandy, going to either the north or south you will encounter steep underwater cliffs that are fun to explore. Taking a boat farther out into the lake opens up many potential dive sites that we haven’t been able to explore yet. Culver and Metolius, Oregon are the two closest small towns. Redmond and Bend are further south and have more services. 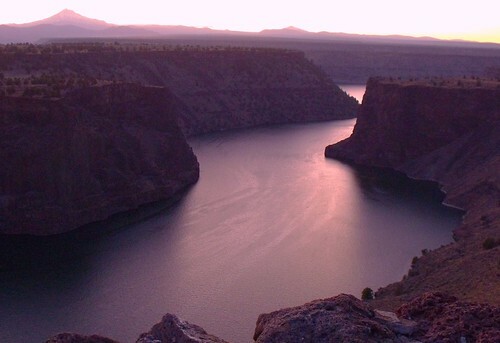 From US 97, follow signs for Lake Billy Chinook and The Cove Palisades State Park. You’ll end up on SW Jordan Road as you descend into the canyon. Right after the switchback at the bottom, the marina is on the right and clearly signed as the Crooked River Boat Ramp. Parking is plentiful although it fills up on weekends in the summer. Be sure to park in the lot that is appropriate for your vehicle. Don’t take up a boat trailer spot with your car. The last time we were here, we paid to park but that may have changed. Imagery ©2017 Google, Map data ©2017 Google. The Crooked River Boat Ramp has a lot of good entrances and exits, and varied terrain that keeps this dive site interesting. The site runs roughly north-south. The further to the west you go, the deeper it gets. We haven’t gone beyond 75 feet deep at this site although the depth finder on our boat indicated that out in the old river channel, you can surpass the maximum recreational SCUBA diver depth limit. Around the boat ramp and swimming area, the bottom is mostly flat and sandy. This is a shallower area that is appropriate for practicing your SCUBA skills. To the north and south, the water gets deeper and the terrain gets more rugged and rocky. We have found big boulders underwater that must have plunged down centuries ago from the basalt cap rocks on the mesas high above. Be sure to steer clear of the boat ramp and docks when boaters are present unless you’re helping a boater retrieve lost gear. There is an entrance and an exit for everyone here. Most of the entrances are easy walk-ins. A few you have to do some big steps down to the water. At the boat ramp, someone with limited ability can walk right into the water. The Crooked River Boat Ramp can be dived as a shore dive or a boat dive depending on what you want to do. If you’re doing a boat dive, we suggest you head further north along the lake and check out some of the cliffs up in that direction. The entire lake is diveable although you need to check with local regulations to see if SCUBA divers are allowed everywhere. You sometimes can get a little wake from boaters coming into the marina too fast. Otherwise, there can be a little current to the west of this dive site if the Crooked River is running high during the spring snow melt. Beyond that, this is a pretty benign dive site compared to diving on the Oregon coast. The last time we went diving here, we easily had 50 feet of visibility although during the end of the summer when water quality can be very poor, the viz can go much lower. We have seen water temperatures as cold as 38F at depth and as warm as 60F in the shallows here. In the summer, the lake is packed with boats which makes it a little more tricky to dive around the Crooked River Boat Ramp. However, the air and water are warmer and all of the concessions along the lake are open. In the winter, we have heard that the gate to this site sometimes is closed although we have not had that problem ourselves. This site is diveable all year round. Choose your favorite time of year to go to Central Oregon and head to Lake Billy Chinook! We haven’t gone past 75 feet at this site although you should be able to touch 130 feet without too much effort to the west of the site. Open water divers can dive this site after taking an altitude specialty class. The lake elevation is usually around 1900 feet above sea level making this an altitude dive. This is an easy dive site that can be enjoyed by everyone assuming that you have altitude diver training. Entrances and exits are very easy. There is even handicapped parking right next to the boat ramp. If you want a little more challenge, go either north or south along the canyon walls to find underwater cliffs and deep water. Depending on where you park, it can be between a 50 foot and a 500 foot walk to the entrance. If you enter in the swimming area, you’ll want to kick out 100 feet or so in order to find some deeper water. Otherwise the other entrances don’t require much of a surface swim. Steer clear of the boat ramp if boaters are actively putting in or taking out boats. We suggest flying a dive flag to let boaters know where you are. We have one we use all the time when we go diving in Oregon that we highly recommend. Check out our Gear We Use page for details. There is a full service SCUBA shop in Bend. There are a few restaurants in Culver and more up north on US 97 in Madras. If you have a favorite, please let us know! There are several state and federal-run campgrounds nearby. There is also a private resort just down the road with cabins. If you know of any hotels in the area that are SCUBA diver friendly, please let us know!